Thanks to Google Maps we can see a complete aerial view of the Delphian School campus. As you can see it's quite big; more than 750 acres in extension. In this picture you can see the main school buildings, Larson Hall (administrative building) in front, and some of the dorms on the left. Those dorms are used by the older kids whereas the younger kids are housed inside the main building. This is the first thing you see from the bottom of the hill once you drive past downtown Sheridan and turn right on Rock Creek Road. This is the school gate which you must go through in order to access the private road that leads to the main building. It's still about 1 1/2 miles to the school from this point. Below you can see a 360-degree view of the inside of the Delphian School Gym - Home of the Delphian Dragons. Here is where you'll be able to play Basketball, Volleyball and practice your Cheerleading routines. It also has an elevated indoor running track, a climbing wall, and a weightlifting area. In the picture you can also see the banners on the walls with the highest athletic accomplishments of the different Delphian teams. 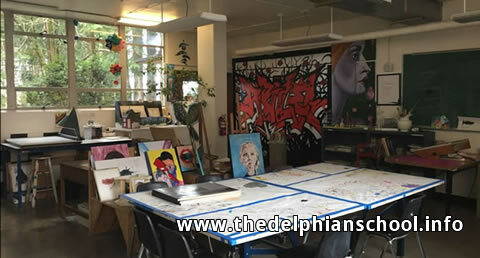 This is the Delphian School folier past the reception area which is used to exhibit the students' artwork and receive visitors. 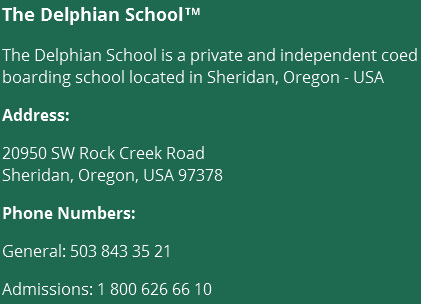 At this point, I would like to remind you that the Delphian School is open for scheduled tours for anyone who wants to learn more about our school, our method and campus. This is the Delphian School's Mess Hall (Cafeteria) which serves 3 nutritious and balanced meals a day for all students and staff. This area is also used to hold parties and dances like homecoming and prom. The wide windows overlook the forest behind the school. 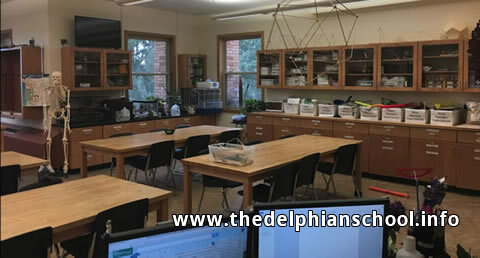 This is the Upper School Classroom at The Delphian School. 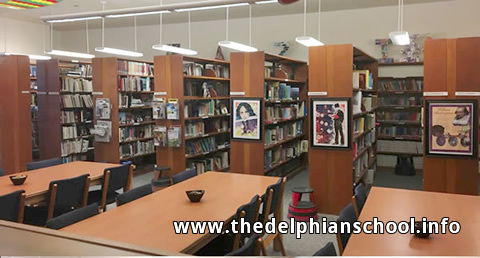 This is the Delphian Library which has thousands of books in stock on a wide variety of subjects. Students are welcome to read and take out any book in its catalogue. The Tech Lab, with state of the art computer equipment which students use to complete a wide range of tasks and assignments. This is one of the classrooms at the lower school where the younger kids study. 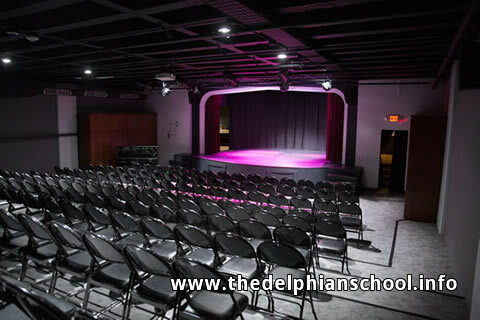 The recently remodeled Theater ("Little Theater") at The Delphian School. This is where the drama department performs its plays and it's also used for music performances, conferences and presentations. Behind the theater you'll find the brand new dressing rooms, which are really awesome. This is the Rec Room where most of the students gather to unwind after a hard day of studying and other activities (Sports, Music, Arts, etc.). Here students can play ping pong, foosball or pool and order delicious snacks and beverages. It's a great place to relax and hang out with your friends. There is also a store and vending machines where you can buy toiletries, laundry products and school supplies. 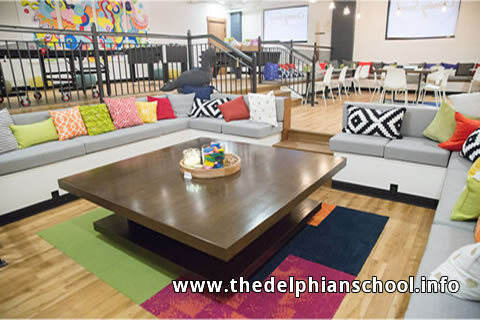 There are many more areas of the Delphian School which we will be adding soon like Larson Hall, the baseball field, the tennis courts, the horseback riding area, the play grounds, the music rooms and the student living areas (dorms). In the meantime, we hope you enjoyed this virtual tour of the Delphian School Campus. Please Like and Share with the buttons on the top. If you would like to visit our wonderful campus, please call to schedule a tour today!